Endoscopy is called also upper GI endoscopy, OGD (oesophago-gastroduodenoscopy), or gastroscopy. A thin (about the size of your little finger), flexible tube is passed through your mouth. This tube is called an endoscope or gastroscope, and it has a source of light and a camera. The scope is passed down your oesophagus (gullet) in to your stomach, and as far as the second part of your duodenum (the duodenum is the uppermost part of your small bowel). Once the scope has been passed into your oesophagus, air is blown in to stretch the walls and allow good views. The camera sends detailed pictures of the inner lining of your oesophagus, stomach and duodenum to a TV monitor. Biopsies – small samples of tissue from the inner lining – can be taken through the endoscope. Biopsies are used to test whether a bug called Helicobacter pylori is present in the lining of the stomach. Also, biopsies may be sent to the laboratory for pathological examination. How is an endoscopy done? You will need to fast for 6 hours before the test. You may be asked to fast for longer or be given special instructions depending on your individual problem. Before starting the procedure, local-anaesthesia spray is used to numb your throat. General anaesthesia is not needed, but you can have a sedative injection to make you feel drowsy. Many patients fall asleep during the procedure. The examination usually takes 10-15 minutes. It is a day-case procedure. You can go home very soon after the procedure if you have throat spray only. If you have sedation, a short period of monitoring is required and you may need to stay in hospital for few hours. Can any procedures be done by endoscopy? 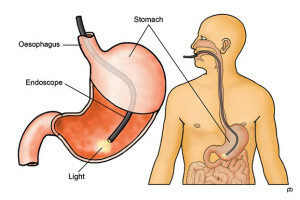 Many treatment procedures can be done by endoscopy. Dilatation is a treatment for narrowing, also called stricture or stenosis. Narrowing can occur in the oesophagus because of acid reflux or at a surgically-created join (anastomosis) because of excessive scarring. Dilatation is done by using a special balloon to stretch the area of narrowing. A medicine called Botox® can be injected by endoscopy in to the lower end of your oesophagus (for achalasia cardia) or into the lower end of your stomach (for gastroparesis). A balloon can be placed inside your stomach to help with weight loss. Are there any risks with endoscopy? Endoscopy is generally a very safe test. But, like all medical procedures, there is some risk. Very rare but serious risks are bleeding, perforation (rupture of the wall or the oesophagus or stomach) and aspiration (backflow of stomach content into the lungs). When will I know the results of my endoscopy? You can know the results of the gastroscopy immediately after the test. But, if you had sedation, it is best to discuss the results later in the outpatient clinic. Also, it can take several days to get the results of pathology tests on biopsy samples.